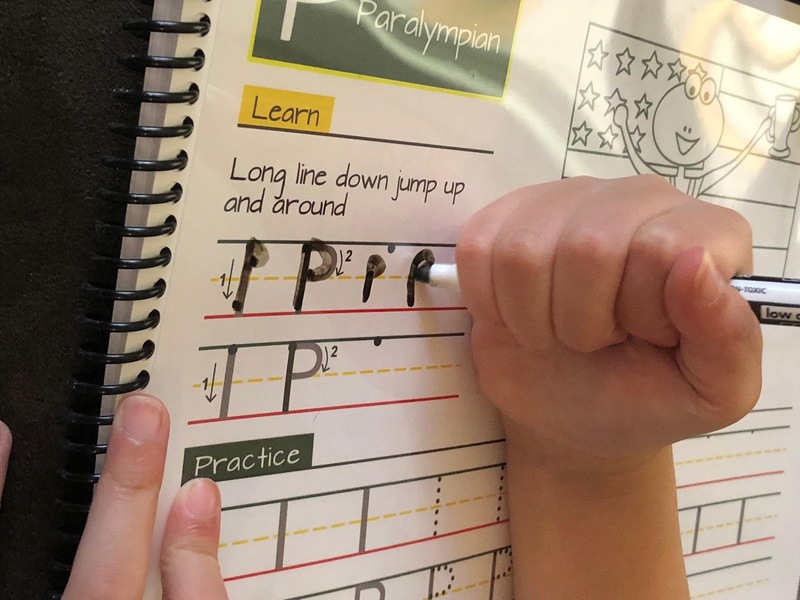 "Long line down and across....long line down across in the middle...short line down and a dot at the top....boomp boomp boomp...."
I have had these words stuck in my head since we started a fun new program from Rhythm & Writing. Princess J is 6, and she's working on perfecting her handwriting skills. Her brain works on a different operating system like Mr. B's, and it's naturally attuned to rhythms and song. Music is one of the easiest forms of communication for our brains to understand, and often times a form of music therapy is used to help teach patients with various forms of brain injuries to speak again. I actually did our own version of musical communication with Mr. B when he was non verbal and most all of his therapists and doctors agree that that was the key to opening the window for him. 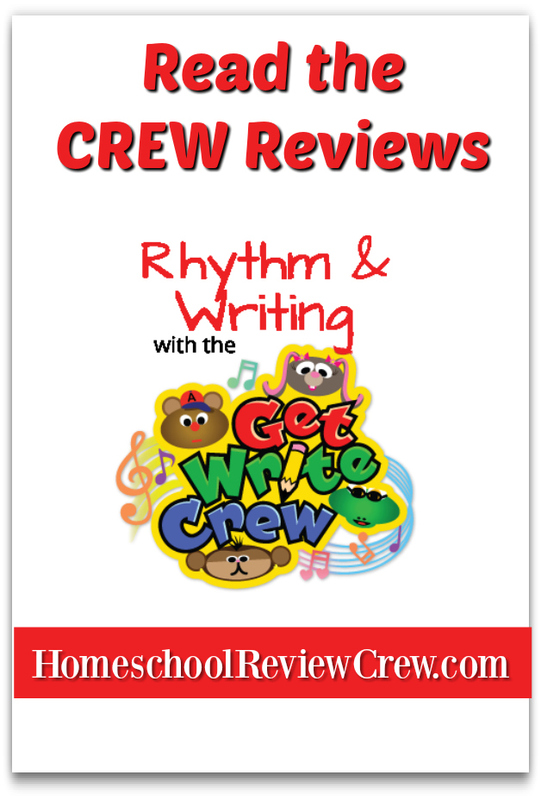 With that said, I just knew Rhythm & Writing with the Get Write Crew would be a HUGE hit here! Rhythm & Writing with the Get Write Crew is a two part program that features a handwriting workbook plus online videos that play an animation featuring "The Get Write Crew" with modern, hip hop style music that corresponds with each letter. Playing off the chanting rhythmic beats of hip hop that make it an easy mode for learning, Rhythm and Writing introduces letter shapes using these easy to remember "ear worm" style tunes that children can repeat as they form the letters. This is ideal for spectrum kids who have that natural ability already, like Mr. B and Princess J. I mean, how often have you heard a song for the first time in over a decade and you were still able to sing along with it, word for word, years later? The same principle applies to this-Kids remember the catchy beats, and they apply it to their writing. The book is spiral bound so it is easy to work with. 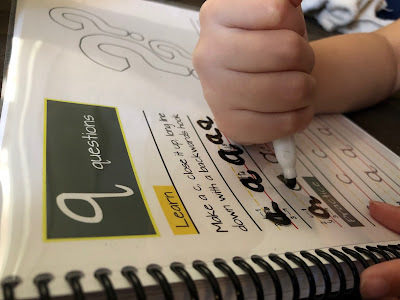 It features and dry erase clear sheet that you can put over each page. This allows for limitless practice with a dry erase marker. First I noticed that Princess J. had a much easier time making the letters with the marker. She didn't have to focus so much on applying pressure with a pencil, because a marker just glides. The same holds true for Mr. B, as well. Princess J. LOVES to color, so I was able to let her color the pages over and over with dry erase markers after finishing the practice work. What I did was first have Princess J. make the letters on her own so that I could see how she formed them. Figuring she was much like her brother, I had a feeling she would make them in non traditional ways. I was right. So I had her watch the videos. I KNOW she liked them! She may not have spoken words, but her face lit up, she giggled, and her echolalia kicked in high gear! She would mumble, hum, and flat out sing the songs over and over! She LOVES them! I noticed that while singing the songs, she would form the letters in the traditional manners, vs. in her own way. That's a huge breakthrough! So I had Mr. B watch them, too, because he too struggles at times forming his letters correctly. 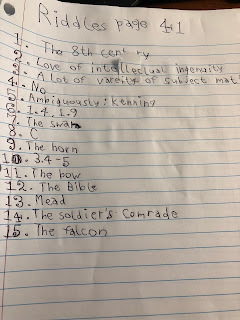 He also has shown great improvement in penmanship, and I can actually read what he has written now! YES we DO need to work on pencil grip, and that's being targeted in OT. Both kids have poor grips. Mr. B's isn't as bad as Princess J's, and he's left handed which plays a roll, too. I wasn't pushing the grip issue for sake of the photo at this moment. Here is a good before and after of Mr. B's. 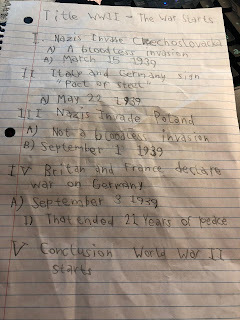 The pencil outline of WWII is before watching the videos, and that's with him really trying hard to write neatly. 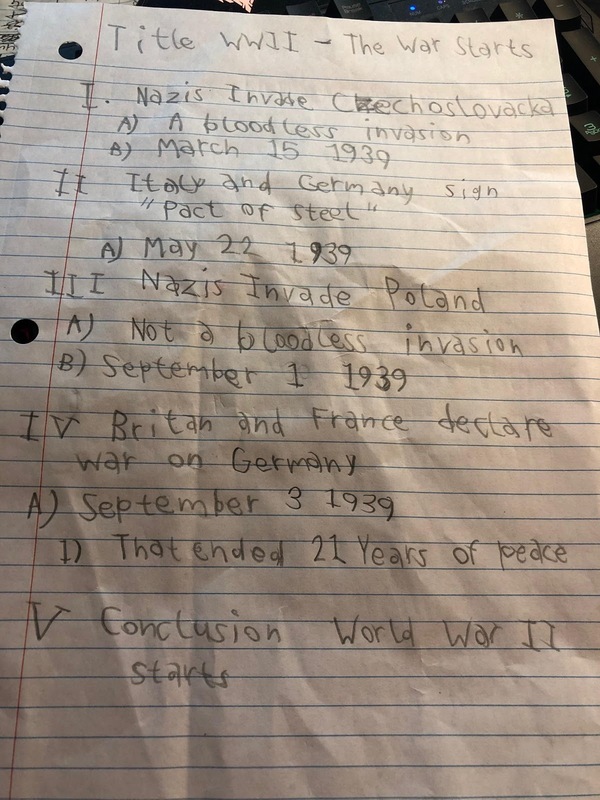 The pen answer sheet is after watching, and I can tell a big difference. Mr. B did not work in the work book. Instead, he watched the videos and applied the cute songs to his school work since he does more writing than Princess J. Overall, I can tell a lot of improvement in a short amount of time in both kids. 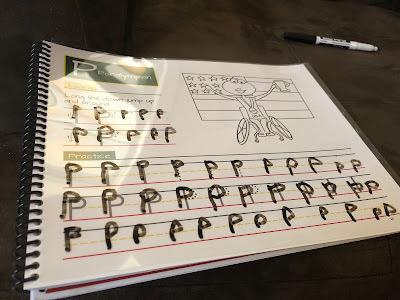 Princess J is able to form her letters on her own, and she's moving more consistently to a traditional formation of the letters vs. her own style. 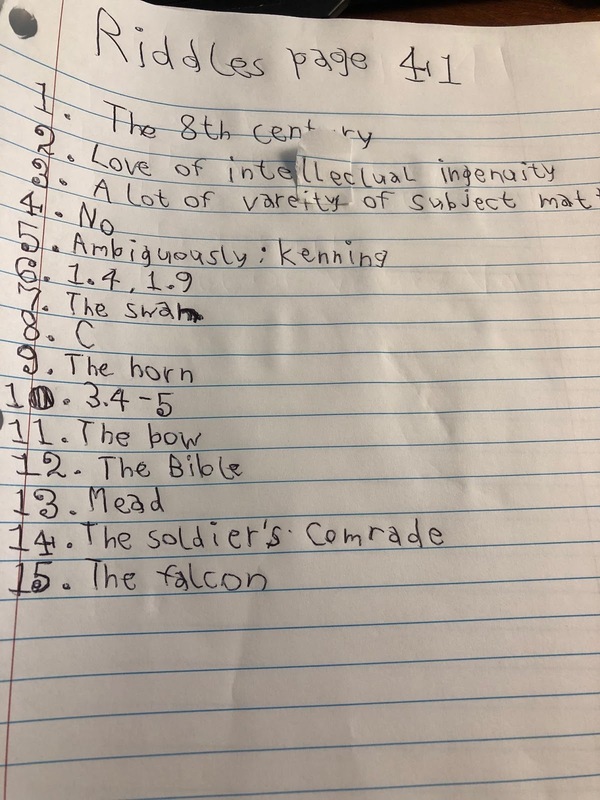 Mr. B's handwriting has really taken a turn for the neater, and I really didn't expect him to have any gains from this at his age, so that's a huge bonus. 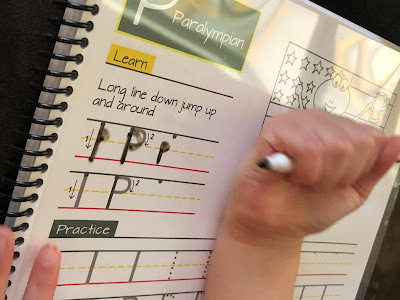 Both kids enjoy the songs, and sing them to themselves during their play, and while making their letters. Overall, I highly recommend this to others and plan to continue using this until we've completed the book with Princess J.! We are only one of 38 families to review this really cool, and up beat (see what I did there?!) product. Please click the banner below to read what other members of the Homeschool Review Crew have to say!